After a difficult start in life, Summer is now learning how fun being a dog can be. Summer is currently living in a foster home and is now used to house-hold noises such as the washing machine, T.V and hoover. She adores a fuss and is affectionate with those she knows, with visitors to the home, she's a little worried and likes a safe place to hide, until the treats come out, then she may meet and greet. 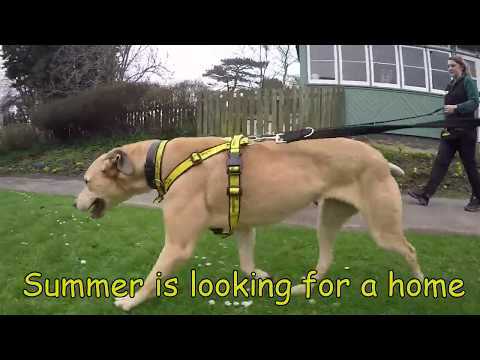 Summer is used to sleeping in the bedroom and loves her garden, she is now house-trained. She can be nervous of new dogs but can make friends and she has a few doggie friends that she likes to walk with. She is motivated by food which is ideal for learning! Summer is looking for patient and understanding adopters who will help her gain confidence. She will need to be given time to settle. She would benefit from a quiet home without too many visitors, as she can feel overwhelmed by too much going on! She could potentially live with another dog in the home, teenage children, and she would need adopters to be around as often as possible as she loves company. Time left alone will need to be built up grdually. Summer is currently living in a foster home. If you are interested in Summer please contact the centre and we can make arrangements with her foster-carers. Thank you for your interest in Summer, who is based at Ilfracombe. Please note this is not a reservation on this dog. To start the rehoming process you will need to go to a rehoming centre for a quick chat. Please find information below about what to expect during the rehoming process. We hope to see you soon.